Robin and Linda Williams perform Sunday evening at Jesup Green, part of the Levitt Pavilion's summer season of free entertainment. 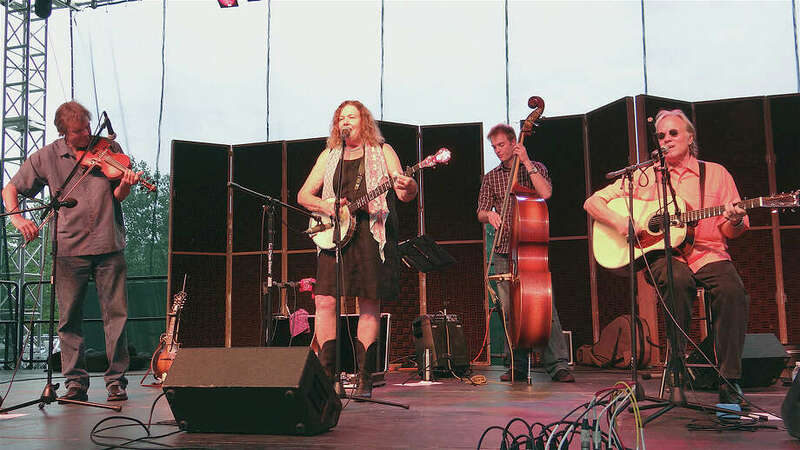 Jesup Green took on a Southern vibe Sunday evening when the bluegrass duo, Robin and Linda Williams, and their band, performed for a crowd at the Levitt Pavilion's temporary stage. The Williamses are regularly featured on "A Prairie Home Companion," the famed NPR program of song and storytelling hosted by Garrison Keillor. Carleigh Welsh, the Levitt Pavilion's director of marketing and communications, described the performers' sound as "new country with an infusion of Americana, roots and bluegrass." "Robin and Linda epitomize an authentic folk sound and genuine earthy quality to their music, combined with the time they spend with the audience," Welsh said. "This is the first appearance of the Shenandoah Valley-based group at the Levitt Pavilion." Coincidentally, the Williamses have been married and performing together for 40 years. "Clearly, 40 is a key number for us," said Robin Williams. "We did our first show in May 1973." "I grew up listening to these guys on Prairie Home Companion," said fan Carlie Armstrong of Stamford. "I never had a chance to see them live. I'm also here helping my friend celebrate her birthday." Another show attendee, Peige Katz of Westport, had taken her daughters to dine at nearby Matsu Sushi restaurant and noticed the event setting up across the street. "We saw the concert was going on and crossed over," she said. "It's wonderful music. It makes us want to dance." Similarly, Ali Kudej, 17, of Easton and friends Carter and Micaela Haas, also Easton 17-year-olds, were waiting for a table at Bartaco restaurant and decided to take in the concert in the meantime. "This music is really different, in a good way," said Ali. "The banjo is a cool sound." The concert, and other Sunday showcases at the Levitt, was sponsored by Jewish Senior Services. "It's our 40th anniversary, so we decided to partner with the Levitt Pavilion as it is also their 40th year as a community facility," said Linda Ciszkowski, vice president and chief administration officer for Jewish Senior Services. "We have many new services we are now offering to the area, including a full range of home care options. This is a good forum in which to promote our services."